Kids teepees have never been more fun! This understated and elegant natural teepee tent will open up a world of delight and excitement for your kids. In classic natural tones with a design that’s made to last, this kids teepee is perfect for pretend play, role play, quiet play and outdoor play as well. Yes, you can easily see that these kids teepees are made for plenty of… PLAY! 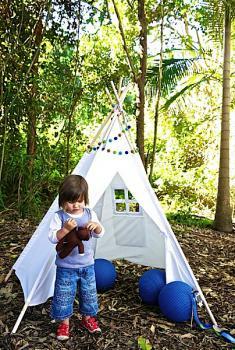 Eye-catchingly crafted in Australia, these natural kids teepees have the perfect amount of space kids need to snuggle, play, craft, colour or nap! Plus, they’re super easy to assemble and dissemble making them super easy to take outdoors as well! Oh, and don’t forget, they look beautifully stylish too so you’ll love seeing them in the kids’ rooms or the family room too! These beautiful natural kids teepees are a perfect place to make memories that last a lifetime. From fun-filled tea parties for toys to quiet afternoons spent reading to giggle-filled craft sessions, these teepees will be a home for your kids to connect, bond, engage and find themselves in! Teepees for kids can be a great way for them to nurture their imaginations, fuel their creativity and also, learn the importance of unwinding, down time and reflection! This item is considered a bulky item and does not qualify for free shipping due to the height and weight of item.